Home » Sports » Baseball » Remy Back in Booth??? Jerry Remy announced he will be returning to the booth for the upcoming Red Sox season. I seen a blog on a local radio station asking if his decision to return bothered you. My initial response was no. You kidding me? No. Jerry Remy didn’t beat or stab Jennifer Martel to death his son Jared did (allegedly). I was throwing this up there as just another thing the media can stir up. There should be no reason it bothers Red Sox Nation. I started to read some comments and a lot of people felt as I did. There were a few people stating that Jerry Remy was a bad father and he should be held somewhat responsible, to which I disagree. I know plenty of people who have been raised by great parents but went and messed up their own lives by abusing steroids, alcohol and drugs to where they beat woman because of anger issues that come with steroid use, to stealing and committing violent crimes for money because they abuse oxycontin. Jerry Remy should not feel responsible. All the comments I have read about this story is that Jerry didn’t do anything and he should be allowed to return without anyone feeling bothered or have a problem with it. Which as all us Boston Red Sox fans I agree, but don’t you think Jennifer Martel’s family are Red Sox fans as well? Put yourself in their shoes. Having to watch a Red Sox game and listen to the father of the person who killed your daughter, cousin, niece, or friend (allegedly), now that would bother anyone of us. Martel’s uncle has already stated its going to be tough for him because he is a huge fan and watches all the games. What are they to do? Only watch the nationally televised games? No that is not fair to this family. I know that Jerry Remy is truly bothered and shows tons of remorse toward the Martel family, but I think he should not return. In an interview he stated he didn’t quit after the first year when he said he “sucked” at broadcasting, and he didn’t quit after his fight with cancer. This isn’t about Jerry Remy’s skills as a broadcaster or his fight with cancer. It’s about the family still mourning the loss of their daughter by his son’s hand (allegedly). 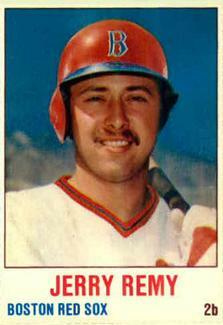 In the interview Jerry Remy stated he would not return if the Martel family asked him not to. Remy shouldn’t wait for that request. Be a stand up guy and retire let the Martel family get on with their lives, I believe it will be near impossible to do if they have to hear his voice every night. I mean it’s probably tough enough with a few restaurants with Jerry Remy’s name attached to it. In closing I hope Red Sox organization does not have any type of “Welcome Back Rem Dawg” ceremony or even messages in the park or game brochures, and defiantly none on NESN. Red Sox fans shouldn’t hold signs up or start chants at games but we all know that will happen. The 2014 season is about defending the World Series, not welcoming back Jerry Remy.